It's never to early for fashion! So Fashioncraft took one of America's most lasting and loved fashion icons - the hi-top sneaker - and made it small in size, but huge in cuteness, style, star power and useful appeal! A perfect fit for a baby boy's shower, first birthday, Christening and more, this favor is a shoe in for smiles! Ordered these favors for my sisters baby shower and I was amazed at how quickly they arrived and how adorable they were. Everyone loved the favors and they were the perfect size. Love how it came in a box with a bow already. Def will purchase from this site again. I Love the Keychain baby favors, good quality, very unique I would definitely recommend. Everyone thought the little sneakers were adorable. I am in love with these favors. I can't wait to give them out at my daughter's shower. Oh and they shipped really fast too! I'm happy customer for sure! My daughter-in-law was so excited about these cute baby shower favors! Also, the shipping was very fast! These little sneakers are very cute, and realistic. They are a great price, and a hit at the shower! They were delivered within a week, with a personalized label. These are really nice. I got them for a baby shower that I'm doing for my daughter. This is the perfect give away. They are priced right the, quality is nice and the size. I ordered these keychains for my daughter’s baby shower. She is having a little boy ! His daddy is a big basketball player and the shower theme is sports so these couldn’t have been more perfect. Even though the packaging is very nice, I removed them and hung them from a “shoe tree!” (See photo) it looks so cute! The sneakers even have little tread on the bottom! Would definitely recommend. fully satisfied with the order placed with nice price favors. order reached on time and it was too cute to be true. 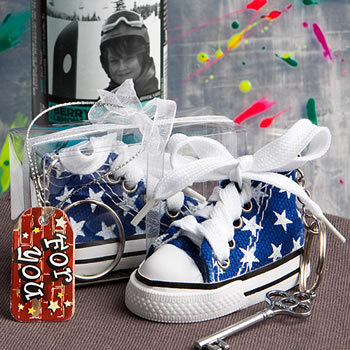 everyone loved the sneaker key chain and it was a super awesome hit at the baby shower party. mom to be looooooved it to say the least. personalized tag got a special mention in the party and i personally felt it was easy to edit and add it as part of the order. thanks much. This is a very nice party favor, I'm expecting my 1st Grandchild and yes its a BOY!!! The favors are for the goodies bags for the guest. This is a cute little show that we gave out at my daughter's baby shower. I was amazed at the how cute this thing was. All of the guests loved it! The quality is amazing for the low cost. Definitely exceeded my expectations. We had been looking for a baby shower favor that was cute and useful...when we saw these little high tops it was a no brainer! Everyone can use an extra key chain for a spare house key! We printed up a cute little poem to attach to the ribbon of the gift box-adorable!!! The favors arrived perfectly packaged and earlier than anticipated! Fell in love at first sight! Very satisfied. Well made. Wow! These are ABSOLUTELY ADORABLE... I can't rave enough about them. The attention to detail is incredible and they are SO WORTH the money spent. Awesome....everyone loved them and are actually usable..which is just what I was looking for. I didn't want to spend money on something that would be trashed. A real miniature shoe.